Dennis Oppenheim, 2-Stage transfer drawing. (Advancing to a future state). 2-Stage transfer drawing. (Returning to a past state), video 3’07’’, 1971, coleção particular. Despite the increasing difficulty in defining “art”—a question that has been somewhat central to the aesthetic debate since the early twentieth century, and intensified with the emergence of postmodernism—a few tendencies can be easily identifiable within the contemporary world. One such tendency, and a meaningful and laudable one, is what has been called by some philosophers a revisionist approach to history; that is, the creation of alternative narratives as artistic and curatorial practice. While this kind of research can be directed towards all kinds of hegemonic histories (like national mythologies, for instance), its eyes have often been turned to art and representation, now presented as the consequence of what we can call a materialist process, historically, socially and economically determined, and not as a simple record of the most significant artists and movements over time. I have recently reviewed two exhibitions (“Picturing the Americas” and “Territórios: Artistas Afrodescendentes no Acervo da Pinacoteca”) that are successful examples of this approach, to which can also be included “Histórias da Infância” [Histories of Childhood], currently presented at MASP. 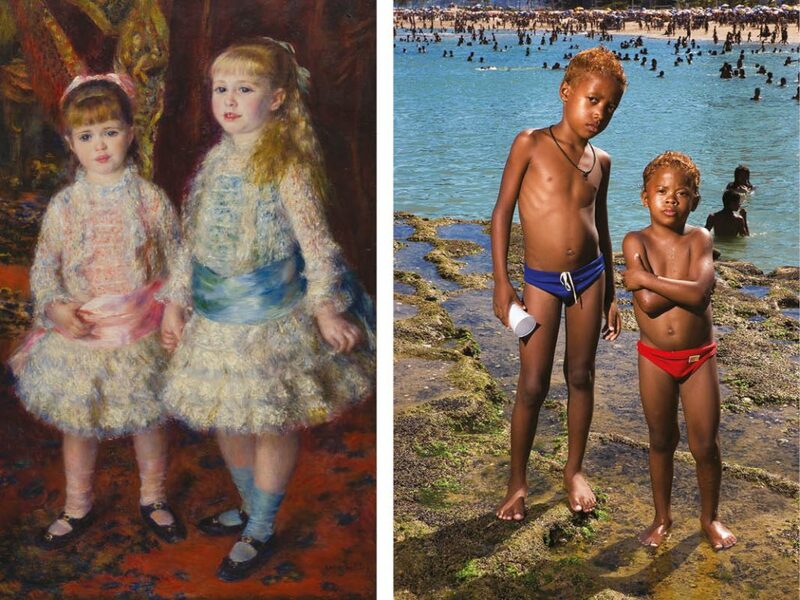 Pierre-Auguste Renoir, Rosa e azul (As meninas Cahen d´Anvers), 1881, óleo sobre tela, 119×74 cm, acervo MASP/Photo: João Musa. Barbara Wagner, Sem título (Da série Brasília Teimosa), 2005, jato de tinta, 57,3×40 cm, acervo MASP. Curated by Adriano Pedrosa, Fernando Oliva and Lilia Schwarcz, the show focuses on representations of childhood, with a comprehensive and transversal approach that places side by side unconnected and diverse artistic manifestations, such as Baroque, modern, contemporary and naïve art, pieces from Brazil, Europe, Africa and Asia, and drawings made by children, some of them specially made for the show in workshops that have been taking place since last January, while others pertain to the museum’s collection and are dated from different moments of its history. This plurality does not, however, led to confusing randomness, as all of the 200 pieces distributed over two floors seem to be exactly where they should. Each artwork is placed in a position to establish a fruitful dialogue with all of the works on its surroundings, either for formal or thematic reasons. 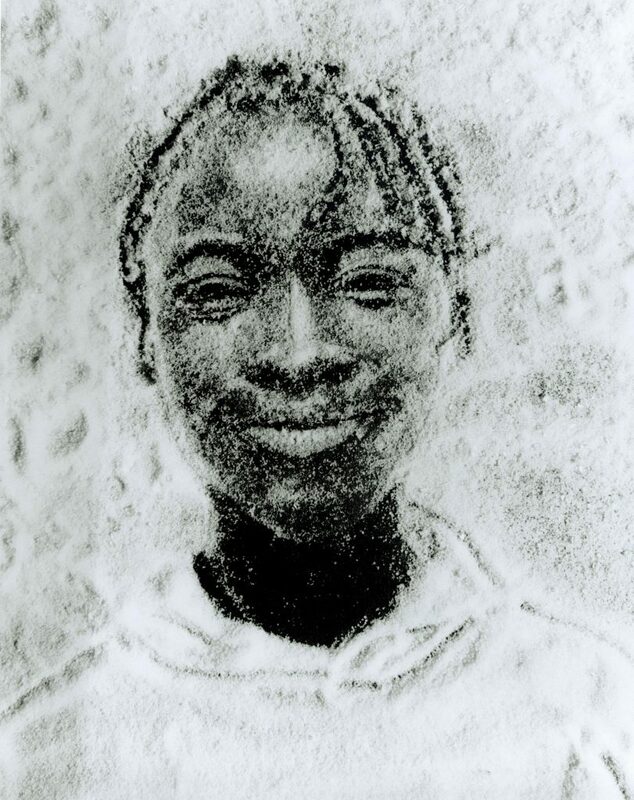 Vik Muniz, Crianças de açúcar, impressão sobre papel prata/gelatina, 34×26 cm cada (6 unidades), 1996, coleção particular. Taking nothing from the artworks—some of them masterpieces—the installation is, in fact, the highlight of the show. All the pieces have been installed at 1.2 or 1.3 meters from the floor, instead of the standardized 1.5 meters. A show themed after a minority or a voiceless population always risks being condescending or appearing as marketing. This exhibition is the opposite. The curators of “Histórias da Infância” knew that only considering children the central subject of the representation wouldn’t be enough. They empowered and gave voice to their histories, by showing their works, having workshops and inviting children to record the audio guides of the exhibition. And, even further: by simply descending the pieces twenty or thirty centimeters lower, they have disrupted the highly coded and institutionalized, almost sacred space of the museum, adapting it for infant bodies and eyes, giving back to them the specters of other children who were never captured with their own fruition in mind.